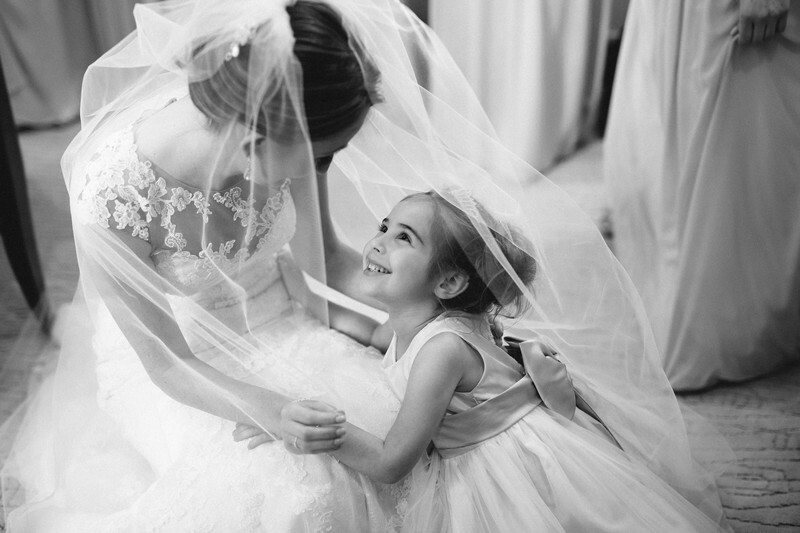 A beautiful candid moment between the bride and her flower girl at The Kitano, Midtown Manhattan. The Kitano hotel is situated right at the heart of Manhattan. Ava the flower girl was extra adorable and all smiles when she saw her aunt Anna who was all set to head out for her wedding ceremony. Although our motto is to document weddings as unobtrusively as possible, we make sure we guide/inform the bride of cool photo opportunities. Often this communication is key to the difference between an average image and one that truly stands out. In this particular case, we saw Ava looking at Anna with love and affection. Anna already informed us prior to the wedding, how special Ava is given Ana is Ava's aunt and godmother. We just casually told Anna "looks like Ava is speechless seeing her god mom all dressed up!". Immediately Anna kneeled down to hug Ava. What followed after that was a beautiful moment shared between the bride and her very special flower girl. Moments like these make us realize the essence of wedding photography, and the privilege we have to document timeless memories this this. Location: 66 Park Ave, New York, NY 10016.